Our reputation is only as good as our last job. As that is true, we highly value your feedback and would like to offer you a $10 account credit upon completion of a review! How satisfied are you with our company? How likely is it that you would recommend our company? What is one thing you were most impressed with by our company or services? What is one thing could we improve upon? Thanks you so much for your business; we truly appreciate you! We would like to invite you to receive a $10 account credit by writing a Google Review for us. Type "Stay Green Sprinklers, Bozeman, MT" in the search bar. On the right side of the page, click "Write a Review" under the business name. To create a Google account, click here. Follow the directions to create an account. Write your review into the text window and rate with stars (we would love to receive 5 stars if you think we deserve it!). 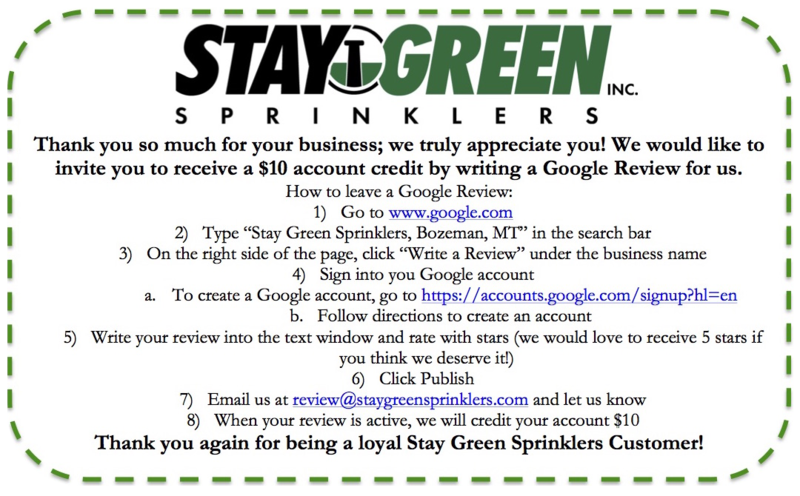 Email us at review@staygreensprinklers.com and let us know when your review is active, and we will credit your account $10. Thank you again, for being a loyal Stay Green Sprinklers Customer!